I have done two cards for this monochrome challenge. Red pearlised card, white lace with red ribbon, red an white gems and the digi stamp I used spectrum noir CR10 and I added some burgundy flowers. 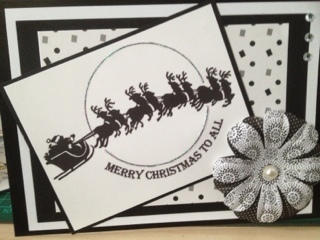 Black pearlised card, white card, black card black and white papermania paper and flowers. White dome pearl inside the middle of the flowers, and three clear gems. These are both lovely but I really like the black and white. 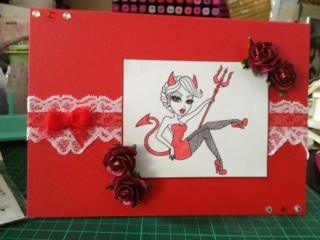 Two stunning cards Sam, I love the lace on the red card with the little devil. Both cards are great even though they are so different. They are both beautiful but I especially love the layout of the black and white one.